Are you a business owner considering retirement or selling your company? Maybe you’d like to transition ownership to a trusted friend or family member. This is a tricky time for your business. If you handle the transition correctly, it could be the best thing that ever happens for you, your business, and the new owner. But if it’s a rocky transition, it could be costly and stressful for everyone involved. At Ascension CPAs & Consultants, we’ve helped hundreds of companies go through this kind of evolution. Your process of leaving a legacy for the next generation is a delicate one. Here are our top 5 tips for handling it successfully. The first step is to do a valuation of your company and determine what it’s worth. This is a critical part of transitioning the business, but it’s not as easy as it seems. The value of your company goes far beyond your equipment, materials, building, and property. It’s also about you - the value you add to the business, which will be lost when you leave. Here’s something to think about: How much is your company truly worth without you? If you’re deeply involved in the day-to-day operation of the business, losing you will be a big hit to the company’s value. If, on the other hand, you’ve already begin to step back and let your employees manage the business, the impact is less strong. The general rule of thumb is to imagine what would happen if you took a 3-month vacation, with zero communication with your business. Would everything crumble, or would the company survive mostly intact? This helps you see your personal impact on the company’s value. From there, you can add in the cost of everything else, like equipment and property. We strongly advise that you seek the help of an accountant, tax attorney, and/or professional business valuation company during this process. After retiring or selling, you’ll probably still need some kind of income. It’s time to make some decisions about how your business transition will affect your financial future. Before starting any kind of negotiation with a buyer, know what your bottom line is. Has your business been covering other expenses in your life, like a car payment, house payment, health insurance, or tax preparation? That should all be part of your calculation. Some business owners decide to sell the business but remain on the board of directors to continue receiving a steady income. Another option is to retain ownership of certain assets, like the property the building sits on, and rent it to the new owner. A financial advisor or business coach can help you understand your options and make a decision that serves you well in the long term. 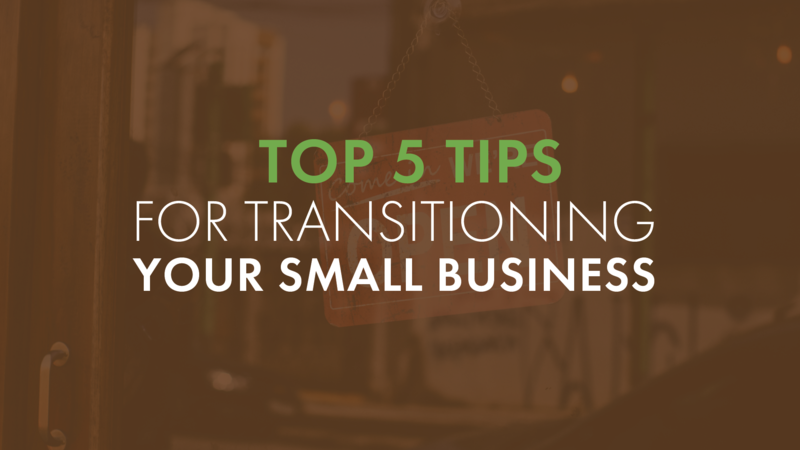 At some point, you’ll need to decide on the exact structure for transitioning the business. Here are your three main options. In an outright sale, you come out cleanly and make money by selling the business. If desired, you can also do seller finance or a note sale, which gives the buyer - who might be otherwise unable to make the purchase - some additional payment options. In a partial sale situation, you sell most of the business, but remain involved in some way. You might be the property landlord, lease equipment back to the company, sit on the board of directors, or retain a set percentage of business ownership. If you give the business as a gift, you don’t make as much money from the sale and will owe taxes. But after gifting the company, a friend or family member could allow you to continue drawing an income, a situation that benefits everyone involved. The lifetime tax exemption is $11.2 million per person in 2018. If you’re selling or gifting the company to someone you know, you might be tempted to keep things casual and do a handshake deal. Verbal agreements are still (usually) legally binding, but they don’t address the many details involved. Casual deals are risky. No matter who’s taking over the company - including someone you love - put absolutely everything in writing. This is the best way to prevent misunderstanding that could harm a friendship or family relationship. Finally, decide on a 100% firm effective date for the transition of the business. This will be important for legal and tax reasons. There should be no lack of clarity on who owns the business on specific dates, or it could become an issue with the IRS, insurance companies, and in any future legal matters. If possible, it’s a good idea to set the effective date on the last day of a month because it makes it easier to close the monthly books and wrap things up cleanly. But if this isn’t an option, work with your accountant to manage all the details for whichever date you choose. Making the transition from being a business owner can change your life. Ascension CPAs & Consultants can help you navigate this transition smoothly. We can also reduce the tax burden of a sale and provide business consulting with a personal touch. Call 405-759-2796 or use our contact form for a free consultation.